I'm pretty sure most people are Harry Potter fans. I know I am. I still remember the first time I ever heard about Harry Potter. I was 18 yrs old. It was 1998 and I was a waitress at Applebee's. I was serving a mother and son, and the boy had this ginormous book on the table. I thought it had to be the mom's, but then he picked it up and was reading it while his mom took a phone call. I made a joke about him reading such a large book and he said,"but, it's Harry Potter." Who the heck was Harry Potter? That night I was talking to my mom on the phone and I made a comment about the boy with such a large book and mom said, "It's Harry Potter." OK, how come even my mom knew about this. But my mom is always reading too! Then started my love of Harry Potter. There is a new website starting up in October for Harry Potter fans! www.pottermore.com It is suppose to be a unique reading experience. What ever that means. JK Rowling has a video explaining what Pottermore is all about on the website. Go check it out! This past week they were giving out clues to get a chance to have a sneak peak at the website early. They had one clue every day for 7 days. 7 Books. 7 Clues. 7 Chances. They had crazy hours to find the clues and most people were waiting up in the middle of the night to find it and grab the magical quill. Well, I know I did! Becca and I got in!!! We get an early access look at www.pottermore.com !! I am SO excited!! We should get our welcome letter within a few weeks and I'll be sure to let all of you know what's going on with the website! Who else is excited for the new Pottermore website? Way to go, I'm glad you were able to get in! I got in too!!! YAY! 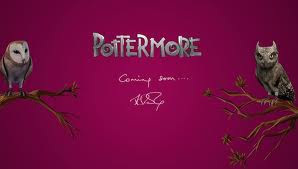 I am so excited that you got in so that I can hear about Pottermore through your blog! Detail, details!